The big ancient place may have rolled down and "obscured the Moon's disc." on the night of May 24, 1926.
a big forward rolling place that crosses down in front of the Moon once again in front of the Moon obscuring the Moon's disc, my Mississauga sighting. A complete and total lucky fluke to be sure but I did see the big ancient place come rolling down. I saw the ancient standing stone craters and I saw the big main shadow. Also I did see the sight of what the first instant in the distance of the Moon's suddenly changed light looks like and I did see the first part of the incredible visual spectacle that the big rolling place generates with the Moon's suddenly fantastically changed now incredible Lasting Light! it's all about the point of a shadow and the fantastically changed incredible spectacular light from the Moon! This is an attempt to try to present some of the things I saw and some of the things I know and some of my guesses at things in some sort of at least semi organized fashion. Very special thanks to my family, my sisters and especially my very special Mom and Dad for all their love. I want to thank my two children for all of their help and encouragement. The Return Viewer's Guide is for you two!! Thanks for everything! especially all your love!! 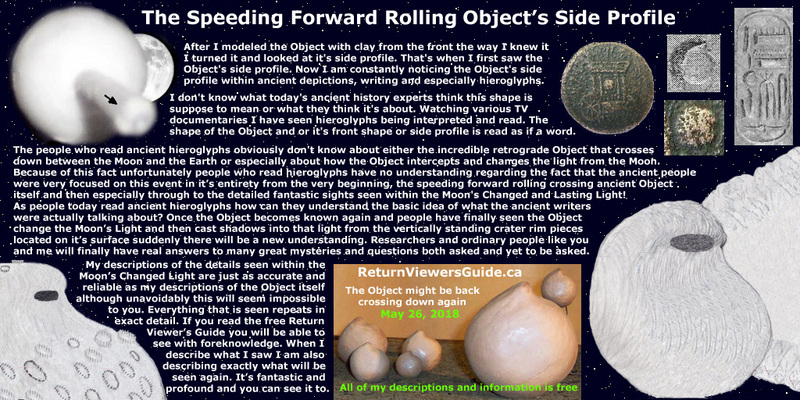 read Return Viewer's Guide #1, you will know the basic idea of what actually happens when the incredible speeding forward rolling Object returns and crosses down in front of the Moon. Sooner or later the astronomical Object I saw and describe on this website will be back. 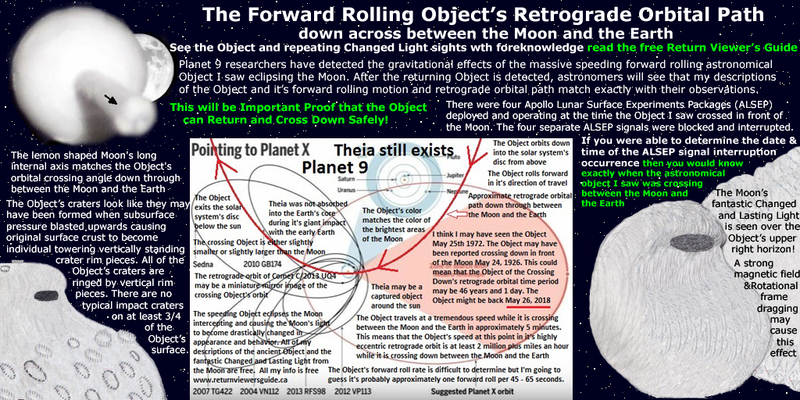 People need to be made aware that it is possible for the speeding forward rolling Object to orbit down across through between the Moon and the Earth safely. The fact that my descriptions of the massive forward rolling speeding Object will match with observations will be proof that the Object can return safely! 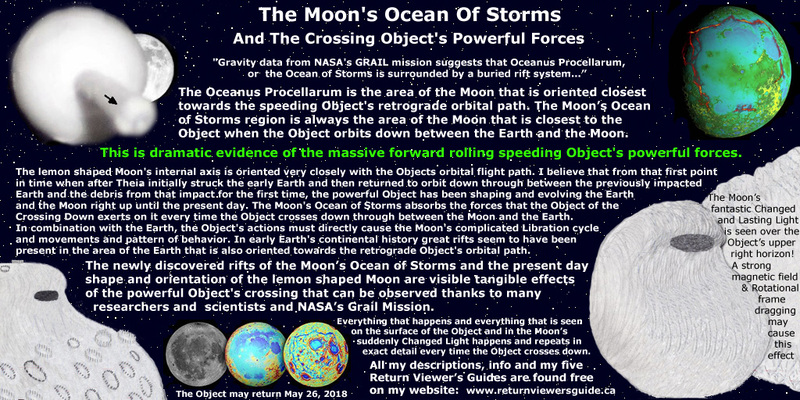 The point is people are hearing and reading and getting a chance to hear the basic idea of what happens when the speeding forward rolling retrograde Object safely returns and crosses down between the Moon and the Earth. Having heard the idea of what happens during the ancient Object's return is a very good starting point for people as they will see and know for themselves one day in the very near future. After this initial first starting point people can file this away wherever the choose and I hope they do file the Return Viewer's Guide page's away preferably offline as a way to ensure future reference and distribution. Print out the five separate Return Viewer's Guides. Believe it or not these five Return Guides and my descriptions are accurate. The speeding forward rolling Object orbits down across between the Moon and the Earth. 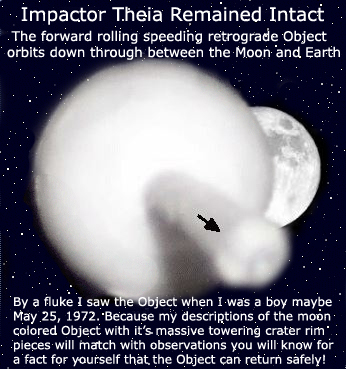 The Object intercepts and then changes the light from the Moon with it's powerful forces. 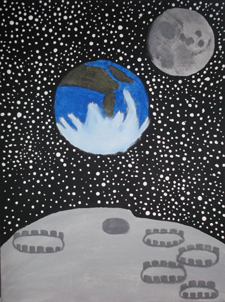 The sights I detail do occur exactly as I describe and in a repeating fashion every time the Object's crater rim pieces cast their shadows out over and beyond the Object's upper right horizon into the distance of the Moon's suddenly drastically changed light. Incredibly the interactions between the Moon's differently behaving light and the shadows that the forward rolling speeding Object's vertically standing crater rim pieces cast into this light happen exactly the same way every time this incredible astronomical object rolls down across in front of the Moon from the upper left to the lower right towards the area below and beside the Sun. I do know that this is definitely true. You can also see the exact same fantastic Changed and Lasting Light sights that I describe. Familiarize yourself with the details and the sequence of events on the Object's surface and in the Moon's Changed Light that I describe. 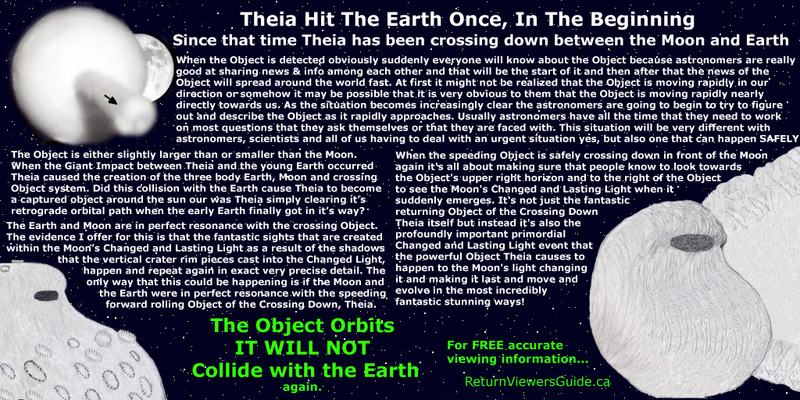 Numbered 1-5 combined, the five separate Return Viewer Guides describe the retrograde Object's return orbit down across through between the Moon and the Earth and what happens in the Moon's Changed and Lasting Light. Look at and follow the point of the biggest widest tallest obelisk shaped very black shadow as it races into the distance to the right. If you do this and you are able to continue looking you will see and you will know exactly what happens when the big main shadow's point suddenly sculpts and shapes the Moon's incredibly stunning Changed and Lasting Light! Eventually you will realize that seeing the Object and the Changed Light sights from the Moon that I describe is a goal of yours. I am trying to put future viewers in a position were they are not at a total disadvantage concerning the sights that are about to once again happen between the Earth and the Moon. As long as you are eventually looking to the right at the point of the big main shadow by the time the wave of the shadow is old and the building out that happens is well underway everything that you see and everything that happens just seems to happen naturally. Believing the details I describe is not important. However having heard the idea of what happens during the forward rolling speeding Object's return having read the exact details even without realizing these details are accurate people will be seeing the ancient Changed Light sights and the ancient sequence of events that I describe and they will be in a situation were they will be realizing that they do indeed have foreknowledge concerning the incredible ancient Changed and Lasting Light sights from the Moon that they will be seeing next as they watch the next Return event unfold. 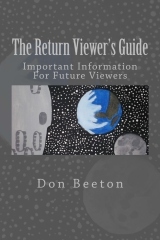 Everyone not knowing the idea and the points that I describe in the Return Viewer's Guide is the alternative. That alternative is not acceptable and is not an option. Slowly but surely I am always further accomplishing more of my basic goals. Worldwide many more people are always finding there way here to our pages and some of those people decide to look around a bit. 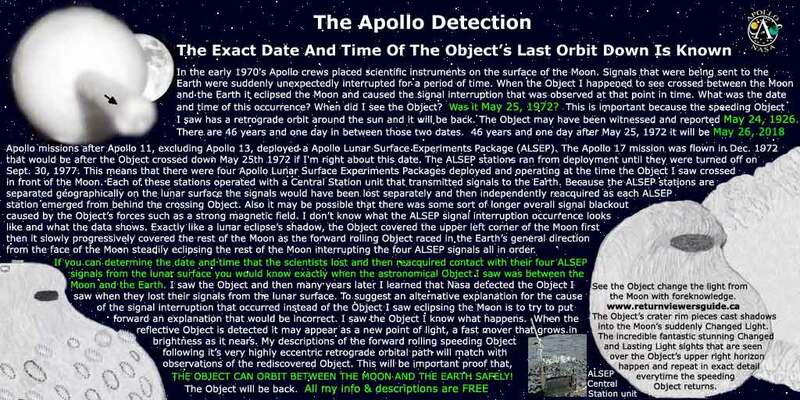 I am very fortunate to be able to describe the first part of the ancient Object's return. 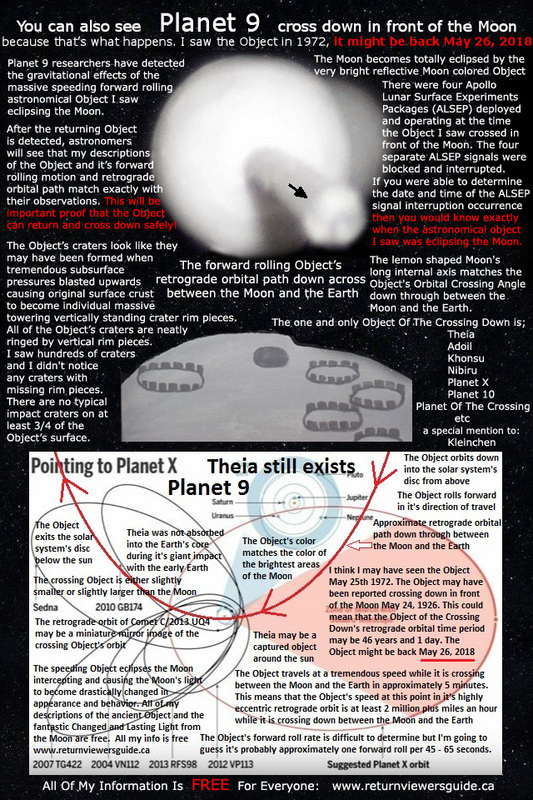 Later after the Object once again leaves to repeat it's very long very very fantastic orbital course and the Moon's light returns back to it's normal state, I hope it will be said that I did the right thing. 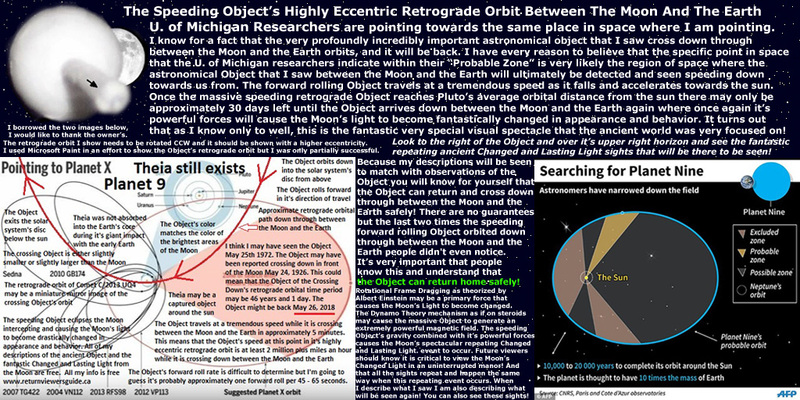 At this point as far as I know there is every reason to believe that the Object's next orbit down across in front of the Moon will happen safely, just like the Object's last Return, the Return that I saw. Good luck to us all, everyone and everything. "Three things cannot long be hidden the sun, the moon, and the truth." I am one who is fond of antiquity, and earnest in seeking it there." "Truth is incontrovertible; malice may attack it and ignorance may deride it; but, in the end; there it is." "The universe is such a strange and wonderful place that reality will always out-reach the wildest imagination." "When a distinguished but elderly scientist states that something is possible, he is almost certainly right. When he states that something is impossible, he is very probably wrong." "That stone, . . . Philosophers in vain so long have sought." until God shall have revealed the truth to all."